How much do Predators suites cost? Prices typically range from $5,000 -$8,000 for Nashville Predators suites. Prices vary based on day of game, opponent, and the location of the suite inside the Bridgestone Arena. Predators games on the weekends will generally be cheaper in a suite. Luxury suite prices for concerts and other events at Bridgestone Arena can vary widely based on the type of event. Lower Level Concourse Suites are the most desirable suites from which to take in an event. They feature HDTVs, Wi-Fi, interior lounge seating, exterior balcony seating, private restrooms, in-suite catering options and a dedicated suite attendant. You will receive VIP parking, private entry into the Bridgestone Arena and exclusive access to the Patron Platinum Club. Suites are available for Predators games and third party events. Similar to the lower level suites, Upper Level Concourse Suites feature all the finest amenities you would expect from a world-class arena. Suites feature flat panel TV's, private restroom, VIP parking passes, comfortable interior and outward facing seating, and the option to purchase in-suite catering. 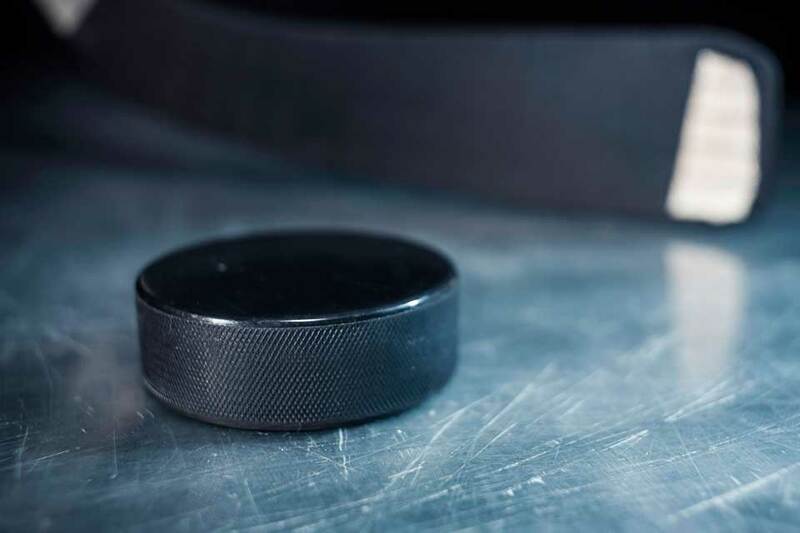 The Nashville Predators shocked the hockey world last season, sweeping the top-seeded Blackhawks in the first round of the playoffs and advancing all the way to their first ever Stanley Cup Final. The Preds will look to build off this success and take the Stanley Cup home this upcoming season. They will look for more solid play from center Ryan Johansen and right wing Viktor Arvidsson, who led the team with 61 points each. The Preds will once again rely on goalie Pekka Rinne, one the NHL's finest goalies who has been a finalist for the Vezina Trophy. P.K. Subban performed well in his first season with the Predators, providing a veteran presence on the defensive front. GM David Poile was awarded General Manager of the Year after his team reached their first Stanley Cup Finals in franchise history. Bridgestone Arena is home to the Predators where they only lost nine games a season ago. Predators suites makes for the ultimate fan experience. A suite for a Predators game includes VIP parking, exclusive access to VIP lounges and private entry into the Bridgestone Arena. Suites will feature HDTVs, Wi-Fi, balcony seating, interior lounge seating, premium in-suite catering options and a dedicated suite attendant. The 2016 Predators are again primed to make a push into the Stanley Cup Playoffs. The Predators pulled off a blockbuster trade in the offseason trading defensman Shea Weber for Canadiens defenseman P.K. Subban. Subban will likely be paired with Roman Josi as the Predators top D pairing. Josi is in his prime at 25 years of age and if he stays healthy he’ll be a Norris Trophy finalist. On the backend, the Preds will return goalie Pekka Rinne. Rinne is one of the NHL’s finest goalies and has been a finalist for the Vezina Trophy three times. Filip Forsberg, Craig Smith, Colin Wilson and James Neal all had 20 or more goals on the season last year. Bridgestone Arena is home to the Predators where they only lost nine games a season ago. Predators suites makes for the ultimate fan experience. A suite for a Predators game includes VIP parking, exclusive access to VIP lounges and private entry into the Bridgestone Arena. Suites will feature HDTVs, Wi-Fi, balcony seating, interior lounge seating, premium in-suite catering options and a dedicated suite attendant. Thank you for signing up for specials at Bridgestone Arena. Enter your email address below to stay in touch. We'll sign you up for our newsletter, which will inform you of the latest inventory and events at Bridgestone Arena. We promise we will never sell or distribute your information. 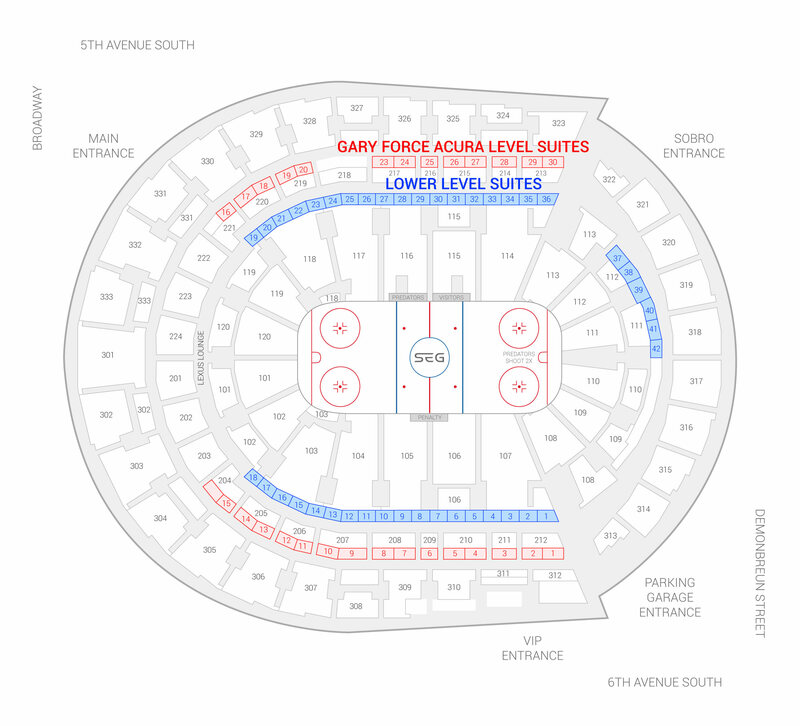 The seating chart below shows where the Nashville Predators suites at Bridgestone Arena are located.